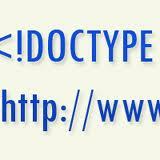 Many wonder what are the first two lines the editors or html programs put us at the start of a web page. All browsers like IE, Firefox, Chrome, Safari and others read these lines to find out how they will treat the document and give the corresponding Visual formats. It is very important that all the pages take them, but in each browser page it will be displayed in a different way, this means that the texts can be focused in Internet Explorer, but in others as Firefox will be pulled to the left, for example.